AUBURN — Lotus Restaurant has presented Good Shepherd Food Bank with a $10,000 donation. The donation is a result of contributions from Lotus customers and matching funds from the owners of Lotus. 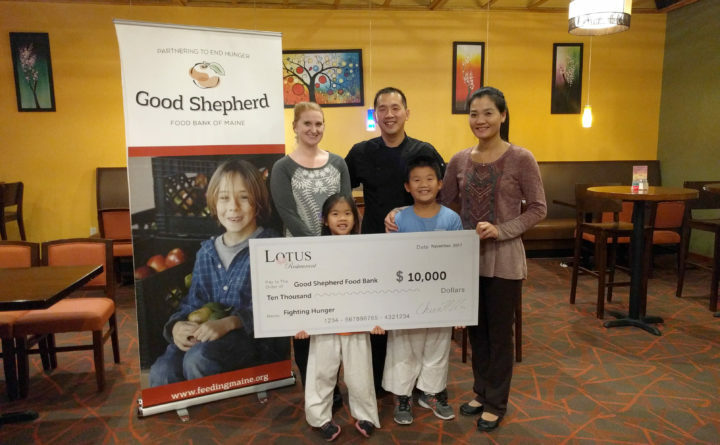 Lotus offered free meals to everyone who entered the restaurant on Sept. 25, asking customers to consider donating to Good Shepherd Food Bank in return. The goal was to help Feed the Hungry, and Lotus found their goal was beneficial in two different ways. Around $4,000 was collected in donations, which was matched by the owners and rounded up to an even $10,000 cash donation for Good Shepherd. Lotus also donated the day’s worth of expenses toward the overall fundraiser, including paying employees and the cost of food, which added about $20,000 as an in-kind contribution. Lotus is located at 279 Center Street in Auburn offering a full buffet with Asian and American options, as well as a full menu. Lotus is a family-owned restaurant specializing in Japanese and Chinese cuisine. Originally opening in 2013, Lotus quickly became one of Auburn’s busier restaurants focusing on the value and quality of its food. Lotus is located at 279 Center Street in Auburn, open Sun. – Wed. from 11 a.m. – 9 p.m., and Thurs. – Sat. from 11 a.m. – 10 p.m. More information can be found at www.LotusAuburn.com.